■ Since it has a thin, rectangular shape, it can be installed in narrow locations. It is also a fiber with good workability and can be mounted directly with screws. 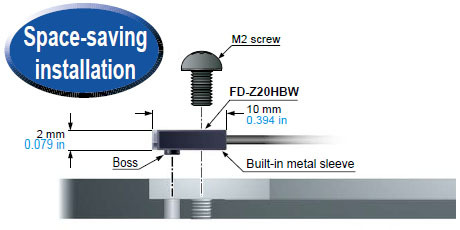 The sensor can be mounted on 1 point with either M2 screw or M3 screw. Metal sleeve in the enclosure helps to be tightened firmly even with a single screw. FT-Z□HBW and FD-Z□HBW is equipped with a fiber guide feature. This enables to mount either way of top sensing and side sensing. Introducing a tough fiber that transcends common knowledge! It has toughness that can be used in moving parts, toughness that can be bent with precision,and high-quality for all purposes. It changes common knowledge about fibers.